26ft7in x 8ft6in Seamaster Cabin Cruiser. Powered by a Volvo Penta aq inboard petrol engine and driven by a Volvo Penta stern drive (both run superbly). Excellent overall exterior condition including canopy which is also in a great condition. Heated by diesel central heating system. 12v and 240v systems with a 2500watt inverter fitted for power on the move. Very spacious cockpit are with full helm system and controls. Fishfinder, and vhf systems fitted. cd player fitted. Large aft bench sea with under storage. The main cabin features a dinnette which transforms easily into a double bed also with lots of under storage. Opposite lies a beautiful galley area with sink/hob, lots of work surface, microwave oven, fridge unit and ample cupboard space. Towards the bow of the main cabin is a walk through shower wetroom consisting of a beautiful fitted and tiled sink unit with mixer tap, shower unit and thetford cassette toilet. In the very front of the main cabin is a seperate bedroom with a v-berth/bed and storage areas. This is a stunning example of the prestigious Seamaster and is short of nothing for immediate sailing. 20ft x 6ft10in Cabin Cruiser built by Elysan / Vanguard. Powered by 15hp 4-stroke Suzuki Outboard Engine (electric start). New Canopy 2015. Out of water and antifouled 2017. Spacious cockpit area with full contol and lots of bench seating. Storage underneath. Bench seats also convert into a 3/4 bed. The main cabin features a forward v-berth which drops into a spacious double bed, a full height storage cupboard and a molded sink unit. This boat is a perfect starter boat and is ready to go with the turn of a key. 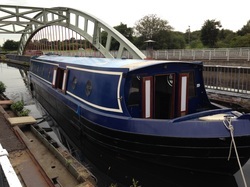 35ft x 6ft10in Traditional Stern Narrowboat Built by Eggbridge Boatbuilders in 1988. Powered by a Lister 2-cyliner inboard diesel engine. Excellent overall exterior paint system including shot blasting late 2018. All windows removed and resealed late 2018. Forward cratch cover in excellent condition. Full hull servey. The boat is heated by a Valor Willow solid fuel stove. At the forward of the main cabin is the saloon which features free standing furnature and ample storage. In the galley there is a cooker with hob, fridge, stainless steel sink with mixer tap and lots of storage and cuboard space. In the centre of the cabin lies a bed with uder storage and at the aft of the cabin lies a small shower room featuring a shower and cubicle and Thetford cassette toilet. Boat Safety Certificate until March 2022. 26ft x 8ft6in Converted Lifeboat. 3 cylinder Lister-Petter inboard diesel engine. Shaft Driven. Some welding required on the hull. Full hydrolic steering fitted (Brand NewUltraflex). Canvas canopy in good condition. Fully internally lined out and partially fitted out. Basic electrics installed. 26ft x 8ft10in Cabin Cruiser. Powered by 4-cylinder Volvo-Penta inboard petrol engine. Driven by Volvo Penta stern drive (Serviced 2018). New prop fitted 2018. Antifouled 2018. Canopy in good condition and watertight. 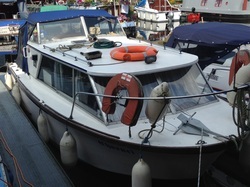 Spacious wheelhouse/cockpit with full width bench seat, 2 captains chairs, a pedestal mounted table and lots of storage. Full controls and steering systemfrom helm position. In the main cabin, there is a seperate toilet compartment with sea-toilet, small galley area featuring a sink unit with running water, Plastimo hob and grill, drawer/cuboard space and lots of aditonal storage. Forward V-berth creating a spacious bed with under storage, a U-shaped dinnette which also creates a 3/4 bed. New fenders fitted and all cruising equiptment present. A Very Nice Boat At A Very Reasonable Price. 20ft x 6ft10in Cabin Cruiser (Builder Unknown). Powered by a 25hp Mariner four-stroke efi (Very Low Running Hours). The cockpit / aft area contains plenty of stylishly upholstered bench seating and a helm area with full controls and a captains seat. In the centre of the cabin there is a small toilet/storage compartment. In the very front of the main cabin sits a very spacious v-berth which drops into an ample sized double bed with plenty of under storage. On the starboard side of the cabin, the is a small galley/storage area. This is a great package ready to go at a very very low price. 24ft x 9ft Cabin Cruiser built by Relcraft. Powered by a Volvo Penta aq145a inboard petrol engine (runs very well, lots of work done recently, serviced February). Driven by a Volvo Penta 280 Sterndrive (serviced February). Spare propeller. Antifouled April 2018. bssc until July 2019. Propex gas heating fitted 2017. Lewrence fish finder fitted 2016. 19" tv with freeview and dvd. 2kw inverter fitted. vhf radio fitted. cd player fitted. Solar panel fitted with charge controller. Air horns (veryloud). Canopy in great condition. Spare canopy with matching window covers. 3 x lifejackets. Forward v-berth which converts into a double bed with under storage, u-shaped dinnette which also converts into a spacious 3/4 bed. Galley area featuring a cooker/hob/grill, fridge, sink unit and lots of cuboard space. Toilet compartment features a sink unit with storage and a Thetford Cassette toilet. This Boat Is Short Of Nothing And Ready To Go At A Very Realistic Price. 30ft x 11ft6in Seamaster 30. Built in 1980. Powered by a Vetus 42hp Inboard Diesel Engine (Only 280 genuine running hours since new). Single engine so lots easier to handle on the canal system than the twin engine models. 6 berths in 3 cabins. Forward v-berth in seperate cabin in the bow with lots of storage and cuboard space. Main cabin houses a very large U-shaped dinnette which drops into a double bed, an ample sized galley featuring a sink unit with running hot/cold water, Smev cooker, surface mounted hob, microwave oven installed and lots of surface and storage space. The cockpit/wheelhouse features a large deck area with ample seating, solid fixed roof with removable back/side canopy and a helm position with full controls and steering system. The aft cabin features a fixed double bed, sink with storage and a shower wet room with toilet facilities. Boats safety certificate until September 2022. This boat is ready to go at a very reasonable price. 1400kg Twin Axle Breaking Trailer. Bearely used. Never used in salt water. Tyres in great condition. Lockable hitch. 32ft x 6ft10in Dawncraft. Powered by a 1.5 BMC inboard diesel engine and Enfield Sterndrive. Fibreglass superstructure with Stainless Steel external panelling and wheelhouse. Internal cabin mostly stripped for re-fit. Cockpit controls installed with helm. A very unusual and eyecatching project at a reasonable price. Lying on the Hard Standing at Stanley Ferry Marina. Requires work in oorder to sail. 32ft x 6ft10in Dawncraft. Powered by a 1.5 BMC inboard diesel engine (very clean). Enfield stern drive (excellent condition) antifouled 2018. Hull also antifouled 2018. Above waterline and cabin top painted 2018. Forward v-berth in forward of main cabin dropping into a large double bed. Dinette which also drops into a 3/4 bed. Storage below both. Large galley area with sink and mixer tap, cooker/hob/grill. Aft cabin contains engine compartment, seating/sleeping bunks and lots of storage. Canopy needs attention. Boat safety until 2022. Possible mmooring at Stanley Ferry Marina with sale (conditions apply). Contact Edd on 07947158642 to arrange a viewing. 20ft x 6ft10in Norman Cabin Cruiser. Yamaha 9.9hp 4-stroke Outboard Engine. Original gell coat finish. Canopy in excellent condition. Refit to an very high standard 2018. Forward v-berth creating a double bed. Small galley area with sink and hob unit with under storage. Small toilet compartment with porta-potti. Full upholstery and curtains brand new. CD player fitted. Depth sounder / fish finder fitted and in working order. Antifouled very recently. Full 4 year boat safety. A Stunning Example Of The Very Popular Norman 20. 40ft x 6ft1oin Cruiser Stern Narrow Boat built by R&D Fabrications. Powered by an inboard bmc diesel engine. Boat Safety Certificate until June 2022. Inverter fitted 1500watt. 3/4 bed bed in the aft of the cabin with under storage. Spacious waredrobe and various storade space. Small toilet/shower compartment with chemical toilet and sink unit. Galley area features a Shoreline 12v Fridge/Freezer unit, cooker/grill and hob, stainless steel sink/drainer unit and lots of storage area. The saloon is mostly free standing with a large sofabed, freestanding unit and wall mounted tv. Heated by a Becton Bunny Solid Fuel Stove. Forward cratch cover fitted 2018. 3 solar panels fitted. An Unbelievably Cheap Narrow Boat ready to go. 45ft x 6ft10in Cruiser Stern narrow boat. Built in 1990 by R&D boatbuilders. Powered by keel cooled 1.5BMC Inboard Diesel Engine. External paint system 2018. Forward and aft covers.Victron Invertor fitted (2kva). Solar charging system fitted wth 4 solar panels and a charge regulator. In the aft of the main cabin is the bedroom, featuring a double bed. Also lots of cuboard and under-bed storage. Next lies the shower room which contains a shower with mixer taps, a built in sink unit with under unit storage and a Thetford chemical toilet. The Galley lies mid-cabin in a U-shaed formation comprising of a large cooker / grill unit, 12v Shoreline fridge (New), sink and drainer with mixer tap, Paloma hot water heater and lots of cuboard / storage space. The saloon area features an L-shaped seating area (New) which easily converts into a second double bed, Built in wall storage and drawer unit. This boat was out of the water in early 2017 when it was blacked and a full set of anodes were fitted. Also, an ultrasonic hull survey was completed which passed with flying colours. 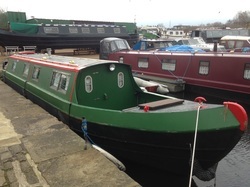 A well priced narrowboat which is ready to go!! 23ft x 8ft6in Senior (Seamaster). Powered by CT Marine BMC inboard diesel engine (Runs very well). Enfiels stern drive. Out of water in 2016. Canopy is Brand New 2018. Boat safety certificate until 2019. Forward v-berth craeting a spacious double bed. Double dinnette which also converts into a bed with lots of under storage. Galley area featuring sink and drainer, twin hob and gas cooker, fridge and lots of storage. Small toilet compartment housing a chemical toilet Mooring included at Stanley Ferry Marina with sale. (Conditions Apply). An Excellent Starter Boat At A Great Price. 23ft x 9ft Seamaster. Powered by a Perkins Inboard Diesel Engine (serviced 2018). Enfield Stern Drive (Reconditioned In 2015). Wall mounted t.v. Inverter fitted. New batteries 2017. Hardwood rubbing strakes replaced out of water late 2016. Antifoul applied late 2016. Canopy waterproof and in sound condition. Upholstery in good condition throughout. Boat Safety Certificate Until 2020. Mooring At Stanley Ferry Marina with sale (Conditions Apply). Forward V-berth creating an ample sleeping area, a double dinnette which also drops into a double bed. The galley area features a Stainless Steel sink/drainer with hot/cold running water, gas cooker/hob and lots of storage space. In the aft of the main cabin there is also a small toilet compartment with a wall mounted sink unit and chemical toilet. A Very Well Looked After Boat In Terrific Condition. 26ft x 6ft11in Cruiser Stern Narrowboat. Built by Robinsons Boatbuilders in Dewsbury. Powered by a recently fitted Beta Marine 20hp inboard diesel engine (44 hours from new. Over £11000 spent on engine and installation). Out of water and "blacked" summer 2017. Large U-shaped seating area in the forward of the main cabin which converts into a spacious double bed with masses of under storage. Wall mounted television. Large cuboard / shelving unit. Becton Bunny solid fuel stove (one of the best on the market). Small galey area featuring a Spinflow hob/grill, stainless steel sink/drainer unit with mixer tap and storage space. Small toilet compartment with chemical toilet, sink unit and storage cuboard. Boat safety Cert. until 2021. A Superb Little Narrow Boat ready to go. 22ft x 6ft10in Dawncraft. Powered by a Honda 20hp 4-stroke electric start outboard engine. Forward v-berth creating a double bed, a single dinette which also drops into a single bed. Fitted galley area with bulit in sink and 2-burner hob, small fridge and microwave oven. Small toilet compartment with porta-potti. The cockpit has a full width aft bench sea, and the helm position has a captains seat and full controls. Possible mooring at Stanley Ferry Marina with the sale (T&C's apply). Call Edd on 07947158642 to arrange a viewing. This boat is ready to go, but could do with a little TLC. 30ft x 9ft De Groot. Built in 1994. Inboard Iveco Turbo Diesel 340hp Inboard Diesel Engine, Full installed and last run in late 2017. Shaft Driven. Requires full internal refit. Comes with depth/fish finder, radar system, radio system, Oven/grill/hob. Yeoman has the potential to make a stunning canal/river/sea boat. Hard standing mooring available at Stanley Ferry Marina with sale (T&C's apply) Contact Edd on 07947 158642 to arrange a viewing. 4oft x 6ft10in Cruiser Stern Narrowboat. Powered by a Lister TS2 inboard diesel engine (reconditioned and fitted in 2017). Fitted double bed with lots of under storage. Spacious shower room with built in shower cubicle with mixer tap. Pump-out toilet. Corner sink fitted with running hot/cold water. Newly fitted galley area with S/S sink and drainer, cooker/hob/grill and lots of storage space. Free standing saloon area with sofa bed. Laminate flooring throughout. Solid fuel stove. A very well priced boat that requires a little TLC. 31ft x 6ft10in Narrowboat. Launched March 2017. Brand new 2-cylinder Bata Marina Inboard Engine. Hydrolic steering fitted (tiller over-ride also fitted). Fully collapsible wheelhouse with opening windows and double glazed glass. Webasto Central Heating system fitted. Ample sized wet room with mixer shower, pump-out toilet and hand basin. Several storage cupboards towards the rear of the main cabin. Leather sofa bed which converts into a double bed. Wall mounted T.V and C.D player and spaker system. Spacious galley area featuring a 3 way Electrolux fridge, LPG cooker/hob/grill, stainless steel sink and mixer tap. Lots of kitchen storage. This boat has been a long term project that has been completed April 2017. Full external paint system including six coats of blacking and full set of magnesium anodes. Rope bow/stern fender. This is a great little narrow boat for a very realistic price. 20ft x 6ft10in Norman Conquest. 9.9 Suzuki 4-stroke outboard engine (2006 model). New canopy fitted late 2014. Forward cabin consists of a large v-berth creating a double bed, port side storage area containing a brand new Thetford Porta-potti and a starboard side built in unit housing a sink unit. Cockpit consists of 2 seating positions, one with full helm controls, and another for a passanger. The aft cabin has full length seating down either side which also drops into a bed. The stern double doors offer access to the outboard engine. 12v LED lighting. 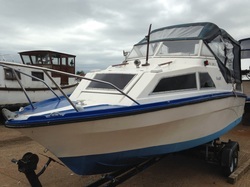 An excellent little boat, ideal as a starter boat at a very reasonable price. Moored at Stanley Ferry Marina (WF3 4LT). Mooring available with sale (conditions apply) aqt the cost of £74.15 pcm. Ready To Go. 23ft x 9ft Seamaster. Perkins 4108 Inboard Diesel engine (Reconditioned by Lockside Engineering and very few hours since). Enfield Sterndrive (Stripped down and refurbed by Leeds Marine). Forward V-berth creating a double bed. L-shaped dinette mid cabin also creates a double bed. Ample sized galley fitted with sink unit with running water, cooker with hob, small microwave oven and lots of storage and work surface. Seperate toilet cubicle with fitted Jabsco Sea-toilet. In the cockpit, there is a large seating area, helm seat, stainless-steel steering wheel. 600watt inverter fitted. CD player, Eco-sounder and vhf fitted. A very tidy example of the very popular Seamaster. 45ft x 6ft10in Cruiser Stern narrow boat. Powered by keel cooled 1.5BMC Inboard Diesel Engine. In the aft of the main cabin is the bedroom, featuring 2 single beds which could be easily converted into a double bed. Also lots of cuboard and under-bed storage. Next lies the shower room which contains a shower with mixer taps, a built in sink unit with under unit storage and a toilet area for a chemical toilet. The Galley lies mid-cabin in a U-shaed formation comprising of a large cooker / grill unit, 3 way fridge, sink and drainer with mixer tap, Paloma hot water heater and lots of cuboard / storage space. The saloon is mostly freestanding, howerver, there is a leather 2 seater sofa with sale, a solid fuel stove and a wall mounted TV. This boat was out of the water in early 2017 when it was blacked and a full set of anodes were fitted. Also, an ultrasonic hull survey was completed which passed with flying colours, and a full 4 year Boat Safety Certificate. 22ft x 6ft10in Teal Cabin Cruiser. Kabota 3 cylinder Inboard Diesel engine (Just serviced) New hoses and belts, fuel pump and injectors reconditioned and new alternator. Enfield Sterndrive (Stripped down and refurbed 2016. Done 5 hours since rebuild). Forward V-berth creating a double bed in its own cabin. Small toilet compartment with new porta-potti. Hot and cold running water. The main cabin features a helm seat with full controls, ample galley with sink and drainer, cooker/grill/hob, 3-way Electrolux fridge and lots of starage space. The aft of the main cabin consists of mainly seating / sleeping area with lots of under seat storage. New batteries 2016. A very tidy boat in a great condition. Call Edd on 07947 158642 to arrange a viewing. This is a beautiful boat that has been very well looked after with no expense spared. 29ft x 9ft6in Sterling Sabre Cabin Cruiser. Twin Perkins 4108 Inboard Diesel Engines (both run very well and had lots spent on them over the last 6 months). Enfield Stern Drives. 12v and 240v throughout. External screen covers for cabin and cockpit. Recarpeted and upholstered within the last 6 months. Forward cabin containing a v-berth which drops into an amble sized double bed with lots of storage. Seperate toilet compartment featuring a Jabsco Seatoilet, built in sink unit and shower. The main cabin contains a galley area with Flavel Cooker/Hob/Grill, sink with running hot and cold water and lots of storage, a 4 seater dinnette which also converts into a double bed with under storage. The spacious cockpit consists of large seating area, helm position with full controls and wheel steering system. Lots of Money Spent In The Last 6 Months. A Great Boat Ready To Go. 26ft x 8ft6in Senior Marine Cabin Cruiser. Perkins 4107 inboard diesel engine. Enfield Sterndrive (rebuilt 2017). Out of water and antifouled 2017. This vessel has accommodation for 4 persons in one large cabin. The main cabin contains a forward v-berth which drops into a spacious double bed with under seat storage, a 4-seater dinnette which also makes a double bed, a Galley area which features a sink unit with hot/cold running water, a hob and grill and lots of storage space. Towards the aft of the main cabin lies a toilet compartment which contains a Jabsco Sea Toilet. This is a very well looked after classic at an incredibly reasonable price. 23ft x 6ft10in Viking Cabin Cruiser. Yamaha 9.9 4-stroke outboard engine. Canopy in great condition. Spacious helm seat with full controls including Sat-Nav and Fishfinder. The main cabin consists a forward v-berth which creates an ample double bed, a single dinnette which creates a single bed, a large galley area featuring a sink with drainer and running hot/cold water, a Flavel cooker / hob / grill, lots of storage and ample work surface. The water is heated by a Paloma water heating system. Propex gas heating system. Wet room including shower with hot / cold water and porta-potti. A Superb Boat Which Is Ready To Go. 31ft x 9ft9in Senior Cabin Cruiser. Twin Perkins 4108 inboard diesel engine. Twin Z-Drive Sterndrives. Full 12v / 240v Systems. 6amp battery charger. Solar Charging System Fitted. 1000watt Nikkai inverter. 2 New Leisure Batteries. TV / DVD LCD Tv. Electric hot water heater. 12v ice-box includeed in sale. Forward V-berth creating a spacious bouble bed. Large double Dinette also creating a spacious double bed. Spacious galley area with 3-way fridge, cooker / hob, sink with drainer and lots of storage space. The toilet compartment contains a Jabsco sea toilet, sink unit, shower tray but no shower head and lots of storage. The helm position has steeing wheel control, twin chrome morse control, Clipper speed log, electric trim tab control, Lawrence VHF radio and Garmin 551s GPS. 29ft x 9ft Sterling Starfinder cabin Cruiser. 1.5 bmc inboard diesel engine. Shaft driven with a hydrolic gearbox. Bowthruster and sternthruster fitted. Canopy in good condition. 12v/240v throughout. Navman fishfinder fitted. Eberspacher air blown central heating (full working order). Forward cabin featuring a full sized bed and storage. Wet-room containing a jabsco sea-toilet, shower and sink unit. Galley consists of cooker/hob/grill, sink unit with hot and cold running water, 3-way fridge and adequate work surface and storage. The spacious cockpit consists of a large 6 seater dinette that drops into a double bed, lots of under seat storage. The helm seat is very comfortable with all controls at hand. there are also double patio style double sliding doors opening onto a covered back deck. Boat Safety until March 2021. Mooring At Stanley Ferry Marina with sale. Conditions apply. 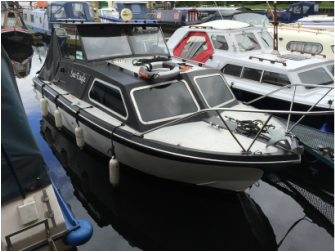 36ft x 6ft10in Traditional Stern Narrow Boat built in 1983 by Cole Craft Boat Builders. 2.2BMC engine fitted with brand new gearbox, shaft and propeller (2017) Current ultrasonic hull survey. 12v solar charge system. Heating via solid fuel stove. Forward tradtitional cratch with solid wooden frame and dropdown canvas sides. The saloon area to the front of the main contains mainly built in seating with full under seat storage which converts into a full boat width bed. A large galley area featuring a Paloma water heater, sink / drainer with hot and cold running water, a 3-way fridge and lots of storage space. Opposite the galley lies a 2 seater dinnette which creates a single bed. There is a small shower room with a chemical toilet. At the aft of the main cabin there are 2 spacious single beds / crew quarters. In total, this boat sleeps 5 people. Boat Safety Certificate until July 2019. 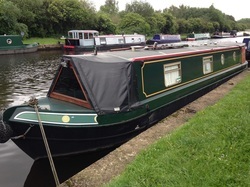 Tranquil is a lovely traditional narrowboat in great condition. 55ftx6ft10in Cruiser Stern Narrowboat built in 2002 by Herron Boatbuilders. Isuzu inboard diesel engine (Keel Cooled) Bowthruster fitted. Aldi Gas central heating and Arrow Becton Bunny solid fuel stove. The stern door is oversized to accomodate a wheelchair as there is an installed access platform allowing wheelchair access (slight woodwork alteration required to recommission). From the aft of the cabin lies storage room with several waredrobes and storage compartments. Next lies the sleeping compartment which consists of a bed with under storage and above head storage. The shower room / wet room features a pumpout toilet, a built in sink unit with under storage. The shower room extands into a full boat width walk through room. The galley features a Shore line 12v fridge, sink and drainer unit with running hot and cold water, a built in hob and a Flavel cooker/grill. The saloon area has an L-shaped dinette that drops into a 4ft bed also with under storage, a built in TV cabinet with fitted Satelite Dish and box. Full exterior paint system 2016. Forward cratch cover in excellent condition. A Superb Built By A Very Reputable Builder At An Unbelievable Price. 20ft x 7ft4in Viking Cabin Cruiser. Powered by a Honda 15hp 4-stroke Outboard Engine. Aft cockpit consists of a helm seat and full width bench seat. CD Player fitted (12v) with 4 speakers. The main cabin has a spacious forward v-berth which drops into a double bed, a single dinnette which also drops into a single bed. The galley has a sink/drainer with hot and cold running water supplied by a Morco gas water heater, a Calor Flavel gas cooker / grill / hob. Cabin recarpeted throughout 2017. Canopy conditioned 2017. Out of water and antifouled 2016. A Very Clean Boat At A Very Reasonable Price. 24ft x 8ft6in Eastwood Cabin Cruiser. Powered by a Ford Wortamota Inboard Diesel Engine. Shaft Driven. 12v and 240v electrics throughout. Brand new canopy 2016 (cost £2500). Cockpit / wheelhouse re-upholstered 2016 (carpet and cushion). Brand new helm seat. Main cabin contains a forward v-berth greating a double bed, a full height toilet compartment with chemical toilet, a mid-level compartment ideal for storage, a galley area with 2-burner hob, Flavel grill and oven, sink / drainer with running water, 12v coolbox and lots of storage, a 4 person dinette which drops into a double bed with lots of under storage. A very well looked after boat with an engine that runs like new. A bargain at £7,999. Must Go!! 50ft x 10ft6in Cruiser Stern Widebeam built by Dave Clark. Powered by a 48hp Isuzu Inboard Keel cooled diesel engine. Heated throughout by Webasto Thermotop C diesel central heating and Morso Squirel stove. BSSc until 2020. Large galley located at the aft of the cabin featuring seperate sink / drainer, washing machine, fridge / freezer, Newhome cooker / hob / grill, fixed dinnette with lots of under storage and several storage cuboards. Spacious shower room featuring a Thetford Cassette Toilet, built in sink unit with under storage and a large shower cubicle. Double bedroom containing a fixed double bed with under storage, 2 ample wardrobes and above bed storage. In the forward of the cabin lays the saloon. Mainly free standing furnature with a built in Tv cabinet and book case. The forward well-deck is covered by a cratch cover. Professionally valued by a marine surveyor. A Beautiful Boat That Is Set Up As A Live Aboard. 25ft x 9ft3in Birchwood Cabin Cruiser. Ford Sea-Tiger inboard petrol engine. 12v / 240v electrics throughout. Sterling battery charger and charge diode fitted. 2 leisure batteries and 1 starter battery. Poloma water heater (recently serviced but not fitted). Forward V-berth creating a spacious double bed with under seat storage. U-shaped dinette which drops into a bed. Galley area features a Rose 6060 Cooker / Hob / Grill, sink / drainer unit with mixer tap, and lots of storage. Shower cubicle contains a shower (needs connecting) and Thetford Porta-potti. Boat safety until July 2017. A Very Tidy Boat Ready To Go. Sea Eagle is a very tidy boat that has been very well looked after. Must See. 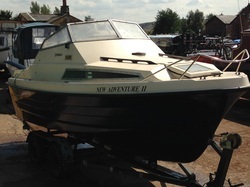 22ft x 6ft10in Dawncraft Cabin Cruiser. Powered by a Suzuki 15hp 4-stroke Electric Start Outboard Engine. Spacious wheelhouse with engine compartment, storage compartments and steering helm. The main cabin is timber lined, with 2 bench seats in the bow, a small galley area with sink and drainer and lots of under storage. 1000watt inverter fitted. The outside of the boat has been recently painted, with anti-slip stainless steel plate fitted to all decks. On the stern of the boat is 2 large storage containers. Boat safety certificate until 05/2019. Almost complete project boat that requires little work to complete, but ready to sail as running gear in full working order. 23ft x 9ft6in Cabin Cruiser built by Seamaster. Perkins 4108 inboard diesel engine (Recently Rebuilt) with Enfield SternDrive System (RecentlyServiced). Spacious Cockpit with helm and helm seat, steering controls, bench seat and 3way fridge unit. Full standing height in main cabin. The main cabin features an ample galley (fitted 2015), a full sized dinnette which converts into a double bed, a forward v berth which also converts into a double bed. Seperate toilet compartment with wall mounted sink unit. 26ft x 8ft6in Senior Cabin Cruiser. Powered by 48hp Inboard Diesel Engine. Enfield Stern Drive. Out of the water for full paint system late 2015. Canopy in excellent condition. Full new fender system 2015. Full internal fitout late 2015. Re-upholstered cockpit and main cabin late 2015. Main cabin features a stunning starboard side galley with sink / hob unit, sold wood work surface, fridge and lots of useful storage space. On the portside of the main cabin lays a spacious toilet compartment featuring a toilet and sink unit, and a cosy seating area with under-storage. The forward of the main cabin lays a permanent large bed. Kitty Shay is a stunning boat that is ideal for any level boater at a very cheap price. Carver 32 Montego. 32ft x 12ft4in GRP cruiser. Built in 1988 by Carver. Powered by 2 Volvo Penta tamd41a Diesel Engines. Shaft driven. Raymarine C80 Navigation Equiptment. Marine vhf.Heated by Eberspacher airblown diesel central heating. Large sundeck / cockpit area with lots of seating / deck area. Very comfortable helm seat / position with full controls to hand. Below deck lies a spacious galley area featuring a 12v fridge, sink with hot / cold running water, cooking facilities and lots of storage / drawer space. At the aft of the main cabin lays an under helm sleeping compartment. On the starboard side of the cabin is a spacious dinette which easily converts into a double bed. At the front of the main cabin area are 2 doors. The first leads to a remarkably spacious shower room with a built in shower compartment, sink unit and sea toilet. The other door leads to the forward bedroom that houses a full sized double bed, storage cabinet with plenty of drawer space. Boat Safety Scheme until 2020. Sale also includes an inflatable tender with Evinrude outboard engine. This is a beautiful boat at a very realistic price. 20ft x 6ft10in Norman Cruiser. 15hp Honda 4-stroke outboard engine. Canopy in good condition and watertight. Forward cabin consists of a large v-berth creating a double bed, port side storage area containing Thetford Porta-potti and a starboard side built in unit housing a sink unit. Cockpit consists of steering position with full helm controls, and a fitted hob. Moored at Stanley Ferry Marina (WF3 4LT). Mooring available with sale (conditions apply) at the cost of £74.15 pcm. Ready To Go. Moored at Stanley Ferry Marina (WF3 4LT). 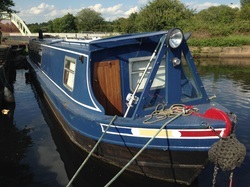 Mooring available with sale (conditions apply) aqt the cost of £74.15 pcm. Ready To Go. Contact Edd on 07947158642 before 7pm if you have any questions or you wish to arrange a viewing. 45ft x 6ft10in Cruiser Stern Narrowboat. Lister inboard diesel engine. 12volt and 240volt throughout. 1000Watt Sterling Inverter Fitted. Sterling Smart Charger Fitted. Heated by 5Kw Solid Fuel Stove. Full external paint system 2016. Fully blacked out of the water 2016.Full set of double glazed windows fitted 2016. Ultrasonic Hull Survey 2013. Full internal refit 2015. Large saloon area featuring a brown leather sofa bed, built in TV cabinet, solid fuel stove with stylish slate surround. Walk through galley area very stylishly fitted ot of solid oak, sink and drainer unit with hot and cold running water, Thetford cooker / grill / hob, under worksurface fridge, full sized washing machine, Morco gas water heater and lots of storage and cuboard space. The shower room features a Thetford C200 cassette toilet, a corner sink unit with under sink storage and a spacious shower tray with above shower mixer. In the forward of the cabin lies a permanent double bed with 6 full sized underdrawers. This is a very professionally fit out boat at a very reasonable price. It was fit with liveaboard in mind. The boat is moored at Stanley Ferry Marina (WF3 4LT) in Wakefield. A mooring is available with sale. Conditions apply. 36ft x 6ft10in Traditional Stern Narrow Boat. Age unknown. Full ultrasonic hull survey November 2013 (Passed). 1.5BMC Inboard diesel engine (just serviced). 12v and 240v Electricity Throughout. Sterlin battery charger. 3 leisure batteries and 1 starter battery (as new). 1200watt inverter fitted. Solar charging unit fitted. Galvanic isolator fitted. LED lighting throughout. Fixed double bed with full under bed storage and a bed-end TV fitted. Very spacious shower room featuring a shower time, a wall mounted sink unit and a Thetford C200 cartridge toilet. Next lies a spacious saloon area featuring an ample sized solid fuel stove (needs new glass), free standing sofa bed and wall mounted TV. The galley in the forward of the cabin contains an under-worktop fridge unit, Thetford Cooker/Hob/Grill, gas water heater, microwave, sink and drainer and lots of storage space. Incredibly cheap for a boat with full survey. Must See. Sold with Mooring at Stanley Ferry Marina (WF3 4LT) conditions apply. As of 1st April 2015 Canal & Rivers Trust Licences became non-transferable. 37ft Cruiser Stern Narrowboat built by Piper Boatbuilding and fitted out by Venetian Marine in 1999. Barrus Yanmar three cylinder 17.3hp diesel engine. Forward cratch cover fitted. New 10/2015. Adequate storage in the saloon area, double brown leather sofa creating a double bed. 5kw solid fuel stove. Secure side hatch. Spacious galley area featuring a Vanette oven with cooker / grill / hob, sink with drainer and fridge. Shower room with a Thetford cassette toilet, shower tray and built in sink unit with under sink storage. Bedroom contains a fixed double bed, under bed storage and over bed storage. 12v and 240v throughout. 1400watt inverter fitted. Battery charger fitted. 2 x 150watt Bosch solar panels fitted. Autumn was painted in 2015 and has recently been serviced. A very reasonable price for such a tidy craft. 42ft x 6ft2in Cruiser Stern Narrow Boat built by hancock and Lane. Ford 4 Cylinder inboard marinised diesel engine. 12v & 240v electrics throughout. 2000watt inverter fitted. 2 x roof mounted solar panels with charging unit. Shower wet room with built in sink unit and Thetford Cassette toilet. Large Galley area featuring Sink unit / drainer, Cooker / Grill / Hob unit, Fridge, lots of storage space and work surface area. A very comfortable and spacious saloon area featuring an L-shaped seating unit which doubles as a bed, lots of storage and shelving and a wall mounted T.V. The bedroom lies at the forward of the cabin and contains a permanent double bed, a storage unit / T.V stand and full under bed storage. The whole cabin has wooden flooring throughout. Heating is supplied by a stunning 5kw solid fuel stove. This a an incredible package for a very reasonable price. Shetland 570. 18ft x 6ft. Sleeps 2+2. Yamaha 9.9hp outboard engine. All new interior, curtains, carpet. New cooker with grill, sink with electric pump, stereo, freeview tv, charging point. Compass, clock, depth recorder, marine VHF radio. Ready to sail with all fenders, ropes and boat hook. Windlass, lock keys. Canal & Rivers Trust licence until 2015. Full BSSC. Has full standup canopy for extra room. Porta potti, solar panel and new battery fitted. 31ft x 10ft Steel Lifeboat project. Steel hull requires plating. Wooden deck and gunnel area. Wooden cabin to coated in fibre glass matting / resin. Spacious wheelhouse with basic kitchen setup (sink, hob and work surface). Main cabin empty and open plan with solid fuel stove fitted. Canopy watertight. Outside sanded and primed. Mercury outboard with sale. Runs but requires attention. A very cheap project with potential to make a lovely boat. 37ft x 6ft10in Traditional Stern Narrow Boat built in 1996 by Maurice Hurst. Re-fit in 2015 to a superb standard by DB Marine (£17000 cost of re-fit). Powered by an inboard Ford diesel. 12v and 240v circuits throughout. 1600watt Merlin inverter fitted. Heated throughout by Webasto Thermo-top C diesel central heating. Hull dressed and blacked in January 2015. In the forward of the cabin is the bedroom which consists of 2 single beds which convert into a kingsized bed, a full height waredrobe and lots of under bed storage. The shower room features a shower unit, a built-in sink unit with under storage and a porta-potti. The galley area has a 12v Shoreline fridge with freezer box, a Thetford Caprice Cooker / Hob / Grill, sink / drainer unit with hota nd cold water, lots of work surface and several storage cuboards. The saloon area is fitted with 2 seats which are also ideal as single beds. The forward and aft decks are cover with canopy covers. A Simply Beautiul Boat For A Remarkable Price. 28ft x 6ft10in Cabin Cruiser built by Burland. Powered by an Inboard Ford 1600 diesel engine. Enfield stern drive. Spacius wheelhouse with helm seat and full width bench. Eberspacher air blown heating throughout. 4 seater dinette dropping into a double bed. Large galley area with sink / drainer, running hot / cold water, gas cooker / hob / grill and lots of storage cuboard space. Shower cubicle with shower unit and porta-potti. In the forward of the cabin, there is a seperate bedroom cabin with a large double bed which also convirts into a v-berth. LED lighting throughout. 12v and 240v systems throughout. An Excellent Starter Boat Which Is Ready To Go. 23ft x 6ft10in Viking Cabin Cruiser. Built in 1991. Powered by 9.9hp Yamaha outboard engine. Forward v-berth creating a double bed with curtain divide seperating from the rest of the cabin. Single dinette which drops into a single bed. Shower compartment containing a spacious shower and porta-potti. The cabin also contains an ample sized galley area with cooker/hob, fridge, sink/drainer with hot and cold running water. Spacious cockpit with helm seat and bench seat. Canopy in excellent condition. Antifouled late 2014. Original gel coat, new mooring ropes. 20ft x 6ft10in Norman Cabin Cruiser. 20hp Evinrude Outboard Engine (Serviced August 2015). Boat Safety until April 2018. New leisure battery and solar panel 2015. 12v re-wire 2015. Out of the water and antifouled in 2015. Forward V-berth creating a spacious full width bed (king size). Small kitchen area with sink and under unit storage. Small toilet cubicle with Kampa Khazi toilet. Cockpit fitted with folding helm seat, bench seats with cushioned upholstery, lots of concealed storage space. Fully carpeted August 2015, Full suede unholstery August 2015, New Fli stereo speakers 2015, and new cooker with gas bottles 2015. 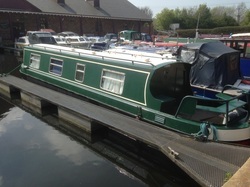 Sale comes with berth at Stanley Ferry Marina WF3 4LT. Call Edd on 07947 158642 for a viewing. A Stunning Example Of A Very Popular Norman Cruiser At A Very Reasonable Price. 27ft x 9ft6in Centre Cockpit Cabin Cruiser built in the mid-70's by Elysian. Boat safery until 2019. Powered by a 1.8 BMC inboard diesel engine. Shaft driven. The forward cabin contains a v-berth which drops into a double bed, a spacious shower room with shower unit and toilet and a built in sink unit. The aft cabin houses a seating area which drops into a double bed, a small galley area and a galley sink. 45ft x 6ft10in Traditional Stern Narrow Boat. Built by Liverpool Boat Company in the mid 1990's. Nannidiesel inboard diesel engine. Victron Inverter Fitted 2015. Victron Battery Charger fitted 2015. 12v / 240v throughout. Full external paint system 2015. New anodes fitted July 2015. Brand new front Cratch Cover 2015 (Black). Fixed double bed at the rear of the cabin with 2 under bed storage cuboards. Shower room with built shower tray, fixed sink unit and pump-out toilet. Galley area fitted with free standing cooker / hob / grill, sink / drainer with hot / cold running water, 3 way fridge connected to 12v system and lots of work surface and storage cuboards. The saloon area contains built in seating units on either side with storage under, a built in TV cabinet and shelving unit. The boat is heated by a 5kw Solid fuel Stove. Carpet required throughout. A Very Attractive Boat At A Very Reasonable Price. 47ft x 6ft10in Traditional Stern Narrow Boat. Built in 1986 by Stowe Hill Marine. BSSC until October 2015. Vetus Inboard Diesel engine (Keel Cooled). Hull Servey. Fixed double bed with under bed storage and a full height waredrobe. Shower room featuring a deep shower tray, built in sink unit with under storage and a pump-out toilet. Gas hot water system. Galley area contains a free standing cooker / hob / grill, free standing fridge, sink / drainer with running hot and cold water and ample storage and cuboard space. Opposite the kitchen lies a drop-down breakfast bar. The saloon in the forward cabin contains 2 built in seats that are ample sized single beds. Morso Squirel 5kw stove. A Lot Of Boat For A Very Low Price. Superb example of a Honda 4-stroke outboard. Hardly used (very low running hours), runs like new. Comes with full engineers report (10/1/15 by Leeds Marine). Short shaft. New impeller (10/1/15). New gear oil (10/1/15). Few marks on the casing but excellent condition. Can be adapted to remotes at extra cost. Comes with tank, line and primer bulb. A very reliable and economic engine at an incredibly low price. 35ft x 6ft10in Steel Narrow Boat. Built in 1990 by Fallwood Marine. Powered by an aircooled Lombardini Inboard Diesel Engine. Brand new engine starter and leisure batteries 2015. Bssc until Feb 2016. 12v and 240v throughout. Ample sized galley in the forward cabin featuring a cooker / hob / grill, Full sized sink with drainer, mixer tap and hot / cold running water. Lots of cuboard space and storage. Spacious toilet compartment with a built in sink unit with under storage and porta-potti. The saloon area features a sold fuel stove and freestanding furnature. The boat was out of the water in 2014 for blacking. The forward and aft cabin doors have tailor made security gates for added security. The forward well deck and the back deck have tailor made canvas covers. This is an incredibly well looked after boat at a very affordable price. 22ft x 6ft 10in Callum Craft Built in the Mid 60's. She is powered by a 4 year old Honda 4-stroke 10hp outboard engine which has very low running hours (electric start). Fully re-fit in July 2010 with full 12v / 240v electric throughout (1000watt inverter fitted). The cabin is stylishly lined in oak finished wood. Large forward v-berth making a large double bed. The Galley area includes a worksurface, sink and drainer and running cold water. There is also a 2 seater dinette. The cabin includes a small beautifully fit toilet compartment with cassette toilet. Painted and anti-foulded in 2014. Canvas wheelhouse with storage bunkers all round and a drop-down table.. New fixed pilot seat in the wheelhouse. This is a very tidy boat at an unbelievably low price. Must see!!! A very reasonable project with load of potential. Shetland 2+2 Seahawk. 20ft3in x 8ft. Inboard 1.5BMC Diesel engine. Enfield stern drive. V-berth creating a spacious double bed, Built in sink unit, Double bed located under the helm deck area, Small compartment for toilet or wardrobe space. Large open deck with canopy and fittings (unknown). Twin axle braking trailer with sale. A fantastic project at an incredible price. Evinrude 60hp 2-stroke 3 cylinder Outboard Engine (electric Start) Full working order with independent engineers report. Fuel tank. Hull painted 2014 (Blue). Topside painted 2015 (White). Non-Breaking trailor with working winch. Small cabin area with bench seats (easily fits 4 people). Mirrored windows for security. Idea as a dayboat, or with a bit of work, a comfortable weekend boat. 54ft Semi-Traditional Stern Wide-beam Narrowboat. Built by Floating Homes. Age unknow but estimated to be less than 10 years old. Yanmar 50 with twin altinators, less than 200 hour usage. Recently out of water for blacking / anodes. Full 4 year BSSc with sale. Spaciuos saloon area with freestanding furnature and beautiful solid fuel stove. Spacious galley area with gas cooker, sink and drainer and fridge. Incomplete shower room with fitted shower and cassette toilet. Large freestanding bedroom in the aft cabin. An excellent widebeam for an unbeatable price. Unfinished project with very little work to do. Must see. Viewing by appointment! 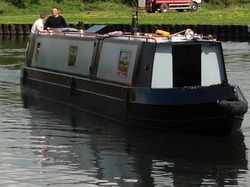 55ft x 11ft Widebeam Canal Boat with a Large Cruiser Stern. Built and fitted in 2006. Fitted with a Vetus 65hp diesel engine (Full Service History). Set up as a live-aboard. 1800w inverter. 50amp Smart-Charger. Solid fuel stove. Full 12v and 240v systems. AGM leisure batteries. Large Kingsize bedroom with plenty of built-in wardrobe space. Large open plan saloon area with brand new hardwood flooring. Spacious U-spaped galley with 12v fridge, gas cooker and hob, oak work surfaces and sunk Belfast Sink. Fully fitted bathroom with a full sized bath with shower, surface mounted square sink bowl and Jabsco pumpout toilet. A superb craft at a remarkably low price. Capable of sailing any British waters and has proven itself on the tidal water several times. All service and maintainance history meticulously kept up to date. A must see. Price includes a full new professional paint system due to begin late september 2014. Excellent private mooring available at Stanley Ferry Marina if required. Transport available to anywhere in the uk. 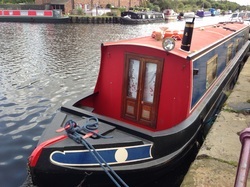 55ft x 6ft10in Traditional Stern Narrowboat built in 2004 by Liverpool Boat Company. Isuzu 33hp Inboard Diesel Engine. 1800watt inverter and 20amp Smart Charger fitted. 55Kgf Bowthruster. 2 x 110ah AGM Leisure Batteries. Eberspacher Diesel Central Heating (Serviced July 2014). Aarow Becton Bunny 5kw Solid Fuel Stove. Full sized fixed double bed with above bed storage, under bed storage, 4 drawer unit and full sized wardrobe. The shower room consists of a Vetus Pump-out toilet, a built in sink unit with under storage, and a very spacious shower unit. In the galley, there is a Vannette Cooker / Grill / Hob unit, a sink with a drainer and running hot / cold water, and a 12v Fridge with small icebox. The saloon area has a built in dinette which drops into a 4ft double bed, built in units and adequate space for free standing furnature. A Perfect Live Aboard that is ready to go. 20ft x 6ft10in Norman Cruiser. 20hp Evinrude 2-stroke outboard engine. Built in sink unit, V-berth creating a spacious double bed, CD radio fitted, Toilet compartment with chemical toilet. Out of water and full paintsystem including antifoul 2014. New canopy fitted 2014. Full set of fenders 2014. Boat Safety until 04/2018. This sale includes a twin axle breaking trailor that needs attention. 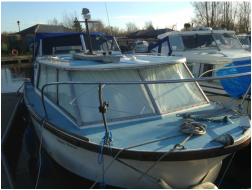 Jemima is a very tidy boat that has been very well looked after and is in a very good condition. An excellent package. 29ft GRP Sterling Starfinder Cabin cruiser. Unknown make and model. BMC 1.5 inboard diesel engine. Wildo bow thruster and stern thruster. Eberspacher airblown heating throughout. 12v and 240v circuits. Seperate double bedroom in the bow. Spacious galley area featuring a gas cooker and hob, sink unit with hot and cold running water, 12v fridge and lots of storage. Wet room with shower, sink unit and Jabsco Seatoilet. The wheelhouse has a large u-shaped dinette that drops into a double bed, comfortable helm position with full controls including Navman Depthsounder, thruster controls and Sony CD radio. Sliding patio doors onto a spacious deck area with fully removable canopy. The canopy is in excellent condition and comes with fitted matching screen covers to provide privacy to the wheelhouse. An altogether excellent package that must be seen. 48ft Semi-traditional Stern Narrowboat built by Morris Hurst Boats in 2000 but professionally refit in 2014. CB Marine 1.5 BMC inboard diesel engine. Large galley area to the aft of the cabin featuring an oven with cooker / grill / hob and sink with drainer. Lots of storage in solid oak fronted cupboards. Free-standing saloon area with a brown leather sofa bed. Valor Arrow solid fuel stove. Shower room with a Thetford C200 cassette toilet, shower tray with Shower Mixer Unit and built in sink unit with under sink storage. Bedroom contains a fixed double bed, under bed storage and over bed storage. 12v and 240v throughout. Oak wood flooring throughout. Sterling 10amp Battery charger fitted. Full interior refit 2014. Full exterior paint system 2014. Full set of 2.5kg anodes fitted 2014. Hull coated with Rylard Coflex in 2014. Engine serviced 2014. Out of Water Survey March 2014. Boat safety until March 2018. A beautifully re-fit boat for a remarkable price. Must See. 42ft8in x 6ft10in Cruiser Stern Narrow Boat built by Hancock and Lane. Ford 4 Cylinder inboard diesel engine (Requires Attention). Full sized double bed in the forward of the cabin with under bed storage. Large saloon area with L-shaped built in seating. Very large galley area with sink and drainer, cooker unit and hot and cold running water. Wet room with shower unit, Thetford cartridge toilet and built in aliminium sink unit. Wood burning stove removed but chimney, colar and fire surround in place. 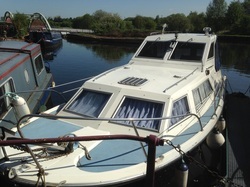 Needs TLC, but an excellent project boat at a very low price. 20ft x 6ft Travellor Marine Fantasy 20. 15hp Yamaha 4-stroke Outboard Engine. 2 Cabins and a spacious centre cockpit. Forward cabin has a v-berth, sink unit area and a storage cupboard. Aft cabin is ideal for storage. Very spacious cockpit with a large sundeck. Need TLC but ideal as a starter boat. Trailor Not Included in sale. 45ft Semi Traditional stern narrowboat built in 2007. BSSC until 2015. Vetus inboard diesel engine. Galvanic isolator fitted. 1800watt inverter. Webasto diesel central heating. 12v/240v systems throughout. Fixed double bed to the aft of the cabin with above and under storage. Spacious and well fitted bathroom with 4ft bath with shower above. Built in sink unit and Thetford C200 cartridge toilet. Large galley area featuring a microwave, Vanette cooker / grill / hob, coolzone 12v fridge, stainless steel sink and drainer with mixer tap. Free-standing saloon area with 2 luxury leather reclining chairs. Sony digital t.v. Viewing by appointment. Moored at Stenley Ferry Band C.
23ft x 9ft Seamaster Cabin Cruiser. Perkins 4108 inboard diesel engine (47hp). Enfield Stern Drive (Recently Serviced). Forward V-berth creating a large double bed. Large dinette dropping into a double bed. Toilet compartment with wall mounted sink unit with porta-potti. Brand new fitted galley including sink and drainer unit, cooker and hob. Large drop-down dinette and newly fitted hardwood flooring throughout. Moored at Lemonroyd Marina between Wakefield and Leeds. Engine: 2 x Perkins 4108 inboard diesel engines. Enfield Stern Drives. New canopy 2008. 12v/240v electrics throughout. NASA Sting Ray speed/distance log. VHF Radio. Double bed in a separate cabin in the bow of the boat.Very spacious wet room with built in sink unit, shower unit and Jabsco Sea Toilet. The galley consists of a cooker/hob/grill, sink unit with running hot and cold water, and adequate work surface and storage. Double dinette that drops into a spacious double bed. The very spacious cockpit consists of large seating area, helm position with full controls and wheel steering system. An excellent package at a very very cheap price. Must go!!! 45ft Cruiser Stern Narrowboat. Full untrasonic survey carried out June 2012. Boat Safety Certificate until 8-2016. Full internal refit 2012. Lister 3 cylinder diesel engine. 1000watt inverter / 20amp smart charger fitted. 3 x 110amp leisure batteries. 1 x 110amp starter battery. Solid fuel stove fitted in the aft of the cabin. Spacious saloon with fitted seating area. Large galley with sink/drainer, cooker and hob, fridge, ample storage hot water heater. Shower room with shower, sink unit, cartridge toilet and under-sink storage. Double bedroom in the forward of the cabin with under bed storage. A particularly spacious cabin for a 45ft boat and at a very reasonable price. 35ft Cruiser Stern Narrowboat built by Liverpool Boats and fitted out by Venetian Marine in 1995. Nannidiesel 375HE diesel engine. Adequate storage in the saloon area, 2 built in sofas creating a double bed. Boatman 5kw solid fuel stove. Spacious galley area featuring an oven with cooker / grill / hob, sink with drainer and shoreline 12v fridge. Shower room with a Porta-potti, shower tray with Johnson impeller shower waste pump and built in sink unit with under sink storage. Bedroom contains a fixed double bed, under bed storage and over bed storage. 12v and 240v throughout. Sterling 10amp Battery charger fitted. Requires slight attention to exterior paintwork. Engine serviced 2013, new starter motor fitted 2012. Out of water survey March 2014. Full set of anodes fitted March 2014. Hull blacked 2014. Boat safety until March 2018. A very reasonable price for such a tidy craft. 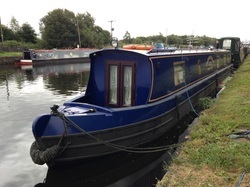 57ft x 6ft10in Cruiser Stern Narrowboat built in 2008 by Vessel & General boatbuilders. Beta 38hp Inboard Diesel engine fitted with hospital silencer. Sterling 3000watt inverter and 50amp smart charger fitted. Webasto diesel central heating and 12v / 240v systems throughout. 2 single beds or 1 kingsize in the front of the main cabin. Lots of storage and full sized wardrobe. Very spacious shower room with full sized built in shower unit, wall mounted sink unit and Thetford C200 cartridge toilet. Large galley area running down the port side of the main cabin with a built in gas cooker with surface mounted hob, stainless steel sink with drainer, ample work surface and loads of storage. The saloon in mostly freestanding, with 2 leather bucket chairs, tv stand and storage cupboard. AGM batteries fitted recently. 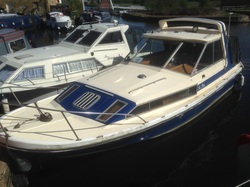 27ft x 9ft6in cabin Cruiser built in 1982 by Bounty. BMC 1.5 inboard diesel engine shaft driven. New starter motor fitted in September 2013. Runs very well, however, needs a minor repair (requires a lift pump fitting as current one worn). Boat Safety Scheme Certificate expires 23-05-2016. 12v & 240v throughout. Inverter and battery charger. Separate bedroom in the bow containing a v-berth which converts into a large double bed, a fitted sink unit and ample storage. The main cabin consists of a 4 seater dinette which converts into a double bed, lots of storage space underneath, a galley are including a sink and drainer, a calor cooker / grill / twin hob, cupboard and drawer space, and storage shelves. Within the main cabin there is also a small toilet compartment contining a sea toilet and a shower unit. At the aft of the boat is a very spacious cockpit with 2 pedestal seats and a 3 seater bench seat. New shower drain pump fitted September 2013, New fresh water pump May 2014. Painted topside 2013.